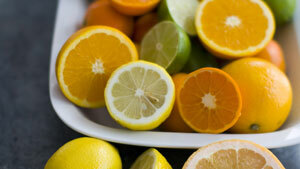 How much Citrus do You consume Daily? “Flavonoids are plant-based compounds with powerful antioxidant properties, which means they reduce inflammation, promote healthy arteries, and help prevent and repair cellular damage”, explains CBC News. Studies show that women who consume flavonoid-rich foods such as certain citrus fruits may help reduce the risk of stroke. In fact, one citrus fruit on average contains 45 to 50 mg of flavanones, which is a specific class of flavonoid which lowers the risk of ischemic (blood clot-related) stroke in women who consume it than those who do not. In fact, what these flavanoids have been proven to do is to improve function of the blood vessel to exercise an anti-inflammatory effect. Researchers found that most of the antioxidant-rich products that lower stroke risk for women were oranges, grapefruit and their juices. Studies have also shown that women with a high intake of flavanoid: smoke less, exercise more, consume more fiber, more folate, more fruits and vegetables, and consume less caffeine and alcohol. More studies are to come, for further confirmation, however keep in mind to intake as many citrus fruits as possible; this also includes antioxidant-rich products, as I spoke about in my first Blog on “Fighting Cancer”. Keep your health intact and do as much as you can to facilitate your growth!